Yes, you've made it! You've landed on Andy's Magic Website, one of the busiest children's entertainers and magicians in Wolverhampton. Andy has entertained at 1000's of parties in Wolverhampton over the last 25 years and just knows how to keep the kids entertained and happy. His unique style of colourful, comedy magic and fun guarantees a magic show and entertainment that will see the kids in fits of laughter and then have them gasping with amazement. His kids disco is fun-packed with loads of great party games and prizes and the children just love his lights and bubble machine. 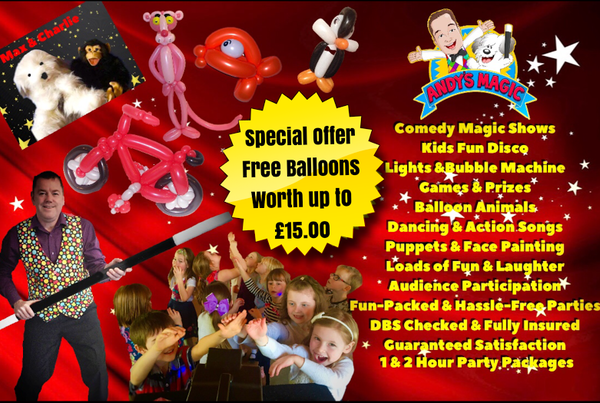 Add in Charlie and Max, Andy's crazy, adorable puppets that kids of all ages will love, the face painting by Karla and balloon animals for all the kids at the end of the party and you've got one amazing complete party package that any child of any age will love. Let Andy do all the hard work and make your party hassle-free. And by booking Andy, children's entertainer and magician for your party in Wolverhampton you're guaranteed to leave everyone with great magic memories too.